Why choose ZNetLive's MANAGED WordPress Hosting? According to the survey by W3Techs, WordPress is used by more than 30% of the web and its usage among sites is growing. Website builders know that they need WordPress to load their websites fast and rank well in SEO rankings. But all might not know how to use WordPress and underlying software work, to its fullest. It takes serious technical knowledge to get WordPress to stay up and stay fast when your website finally succeeds. WordPress being the opensource platform is bit complex to maintain and optimize and thus, needs managed WordPress web hosting services. Shared Hosting vs Managed WordPress Hosting – Which one is better for your WordPress website? Hosting is the most important requirement of any online business and choosing the right type of hosting for websites or blogs is equally important for its success. Shared Hosting is great for building websites as it is the cheapest hosting option but for growing traffic websites, one needs to upgrade to fast and secure option. Also, if the website/blog is hosted on WordPress platform, it needs a fast and optimized environment to deliver the best performance, shared web hosting is not the right hosting model for WordPress sites. Managed WordPress hosting is exclusively designed, developed and enhanced for WordPress CMS. It features all the necessary aspects to run WordPress sites seamlessly – blazing fast speed, auto updates and backups, scalability and uptime, advanced security and protection and most important top – class support, at a bit higher (as compared to shared hosting) but affordable rates. That is why it is termed as the best website hosting for WordPress environment. But it is a bit difficult to find out what is the best option for managed WordPress hosting? Who offers the best inexpensive WordPress hosting? There are many WP hosting providers in the industry but ZNetLive has emerged as the best WordPress hosting provider. It leads in web hosting and cloud services and is the distributor for Plesk, the leading WebOps platform, in India. Managed WordPress Hosting by ZNetLive is designed to provide its users- performance optimization, support, security, and updates. With ZNetLive’s Managed WordPress Hosting everything works. You get complete freedom from the worries of setting up instances, troubleshooting performance issues and managing security and updates. Adding features that contribute to the existing solution is the most important way to improve that product or solution. ZNetLive too has added new features to their Managed WordPress Hosting, now it comes powered by Plesk Onyx which helps professionals, developers, and designers to work smarter and in a more secure way. All WordPress hosting plans from ZNetLive come integrated with Plesk Onyx whose WordPress Toolkit 2.0 helps developers, designers, and other WordPress users to experience the best performance without limitations at fairly economic prices. ZNetLive best WordPress hosting service takes care of optimization and caching. They implement page caching through CloudFlare Cache Purge feature. All WordPress plans feature SSL certificates, DDOS protection, automatic updates and daily backups, a staging environment, threat blocking and privacy, local storage10GB-1TB (as per plan selection), DNS support for both shared and dedicated environment. easy WP installation and updates including one-click hardening, migration of remote instances, and cloning of WP instances. Under WordPress development you get site indexing, debug management and password protection. WordPress Toolkit 2.0 enables WordPress maintenance and enhancements which includes one-click WordPress management, theme and plugin management, automatic updates, multi-site management, WP-CLI and API RPC + CLI support and reseller management. Rock solid security – ZNetLive’s WordPress Hosting is built on NGINX architecture which enables improved security, accelerated application and content delivery along with scalability and availability for the high traffic websites. It also enables server level protection, one-click restore during any disaster, automated backups of your WordPress websites on AWS. You also get complete freedom from all kinds of conflicts that may arise from any other CMS or application residing on the server. 24 x 7 support – ZNetLive provides basic development support-guidance for your problems and ensures that your site works best with WordPress. They upgrade your WP sites automatically to the latest version and migrate your complete WP site and data from the existing service provider, free of cost. For more features, read here. ZNetLive offers five Managed WordPress Hosting plans- WP-Starter, WP-Standard, WP- Professional, WP- Premium and WP- Enterprise. They offer a free trial on their Starter, Standard and Professional plan for 30 days. 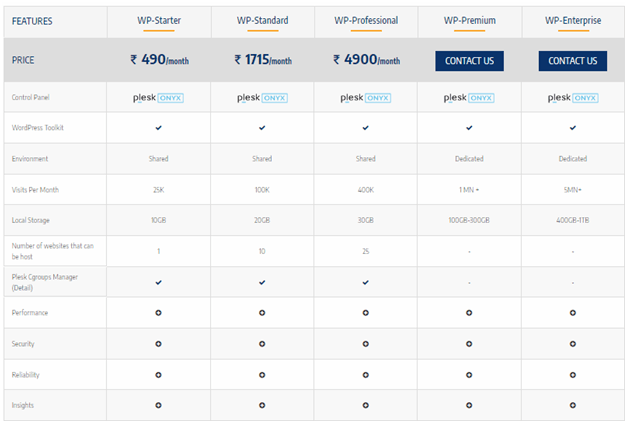 Get an overview of the plans & features with their pricing as well, from below screengrab. They also offer a monthly discount coupon, for their new clients to help them save additional 20% on their total cost. If you have any doubt, regarding the write-up, please share via comments. Next: Next post: How to Get WhoisGuard Privacy Protection Free – forever!